Alex Smith investigates the T-Top version of Axopar’s debut model. Axopar is a very noteworthy new brand. 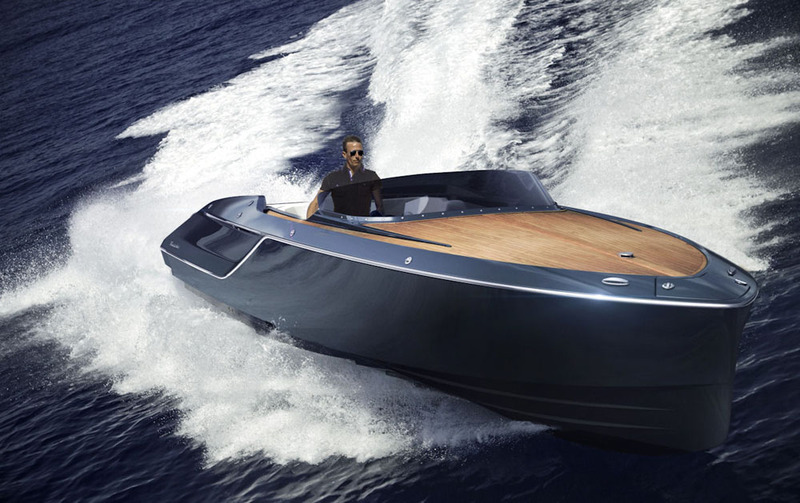 Launched in 2014 by the same people behind Aquador, Paragon Yachts and XO, these award-winning boat builders have already proven that they know what they’re doing. 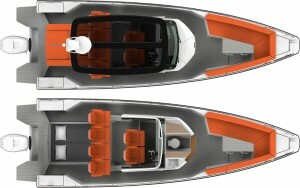 In fact, with a prestigious “Motorboat of The Year” title safely in the trophy cabinet, the idea with the new Axopar fleet is likely to strike a chord with just about any right-thinking powerboater out there – as Sakari Mattila, founding partner at Axopar, points out: “We are devoted to building boats that are exhilarating to drive, competitively priced and fuel efficient”. It’s very difficult to argue with that. 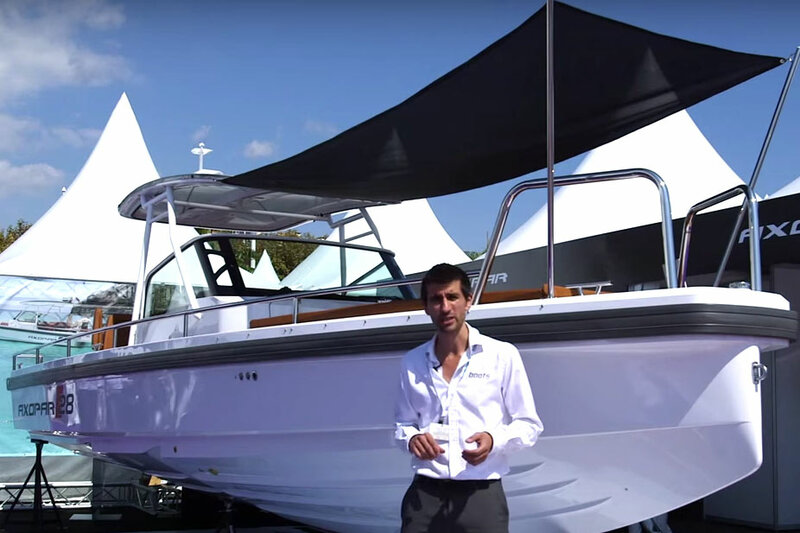 Take a look for yourself with the boats.com First Look Video filmed at this year's Cannes Yachting Festival. 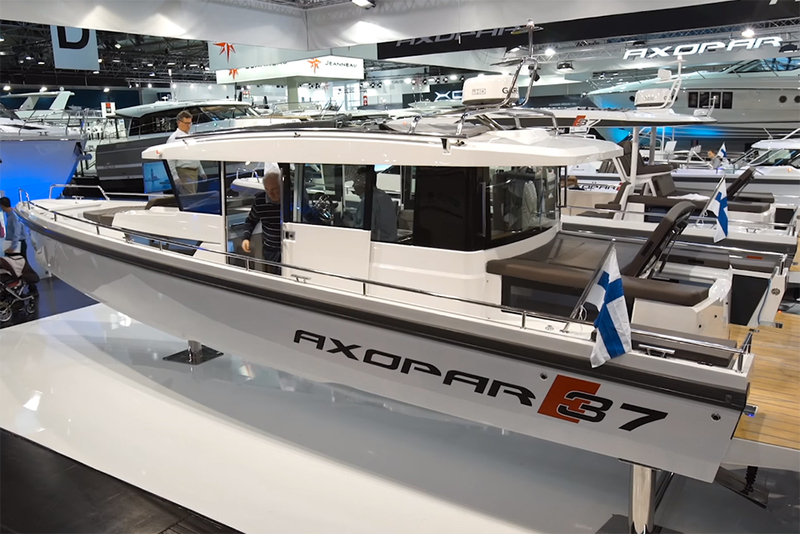 The 28 TT is the first model from Finnish brand Axopar. For a start, that deepset aft cabin is also a lovely piece of work. 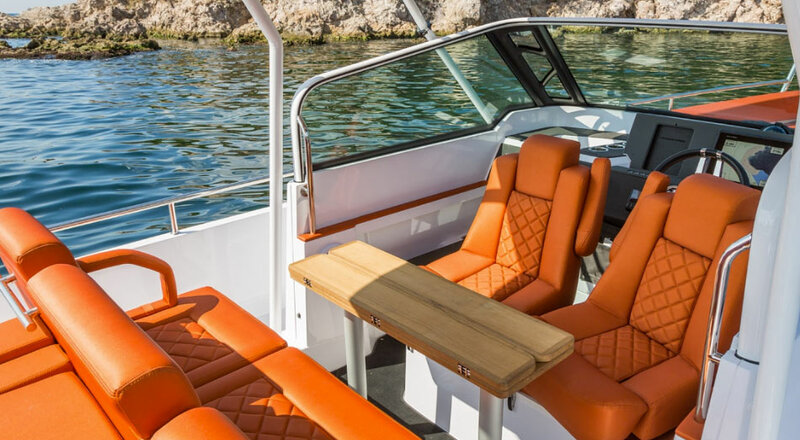 Tucked behind the bench and beneath the aft sunpad, it is accessed by simply lifting the middle section of the bench on its ram-assisted hinge. This reveals a double berth that is remarkably clean, bright and attractive. It sits neatly between a pair of decks that run fore and aft on either side and yet it enjoys not just a generous footprint but also an opening aft hatch and a pair of long lateral tinted window sections to help improve light ingress and provide a proper sea view. 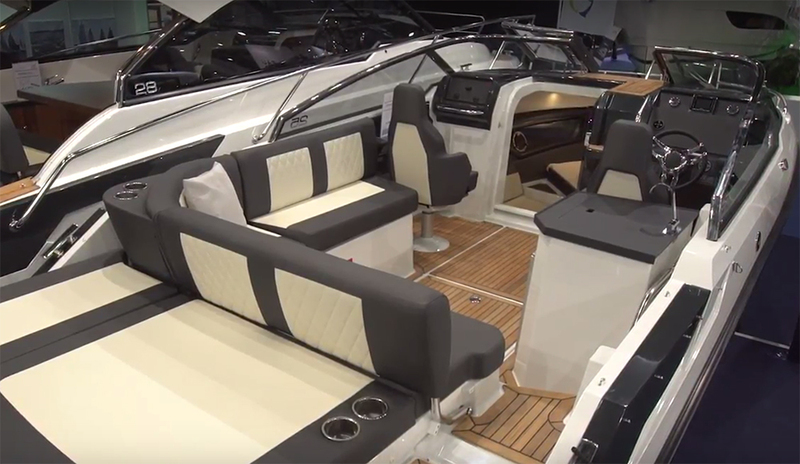 The layout includes a sheltered cockpit, an aft sunbed and a forward dining area. Further forward, the helm is accessed via a small step down from deck level. That takes you beneath the protection of a thickset screen and into the welcome embrace of a pair of swiveling sports seats. Each is equipped with drop-down armrests and shaded by the forward section of the low-profile T-Top. It’s a delightfully confidence-inspiring position with a very low centre of gravity – and with outboard engine options of up to 350hp for performance approaching 50 knots, that’s exactly how you would want it. 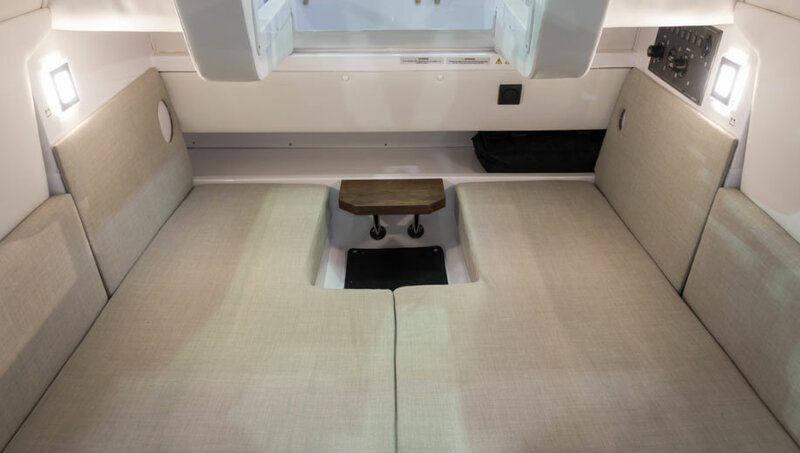 Rotate those helm seats to face aft and, with the removable table in place, you have a sheltered dining area for six people to linger in great comfort without inhibiting the movement of those trying to make their way between the aft sundeck and the forward seating area. And the fact that the cabin is sunken low and positioned way aft also does good things – not just for the weight distribution, but also for the space in the bow. Here, an extended alfresco dining and lounging area, framed between elevated gurad rails, comes with a tailor-made table and the option of an overhead sail-style canvas that runs from the leading edge of the T-Top to some angled stanchions at the forepeak. That gives you plenty of shelter, without compromising on the unswerving practicality of that classic Finnish step-through bow. The deep-set six-man cockpit dining station is superbly conceived. It is plain from the start that the 28 is a performance platform. 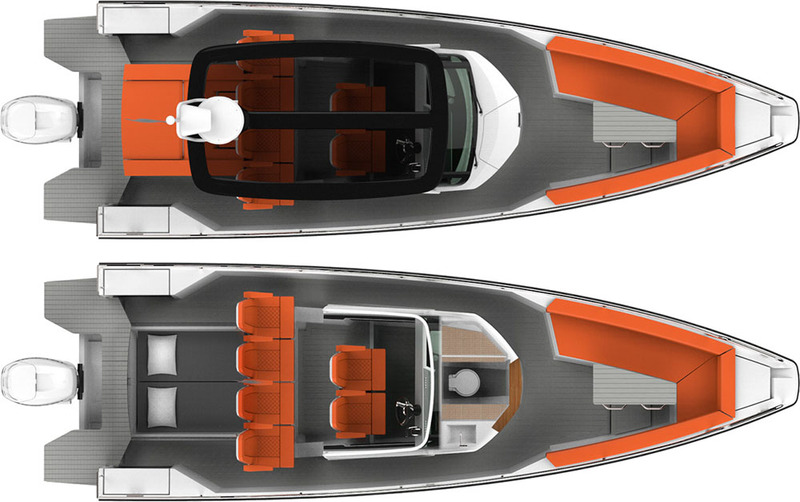 The hull is an acute, deep-V model with deep-cut double steps, and a 22-degree deadrise that narrows to a steep, fine stem with a wave-slicing 60-degree entry. And the layout keeps all substantial items of deck furniture very central, very low and (by and large) a decent way aft. In short, it looks like a very attractive combination of pace, softness, aggression and efficiency – and the performance figures reflect exactly that. 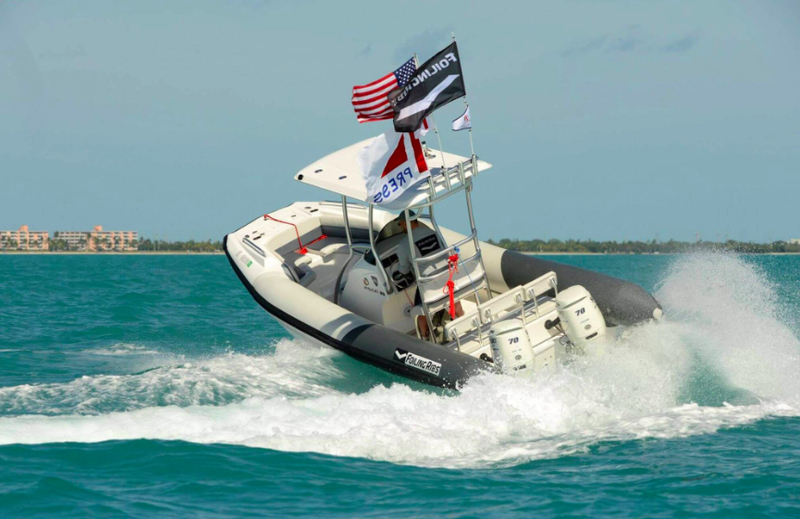 Even with the base 150hp outboard on the transom, you can expect fuel flow figures of around 1.1 litres per nautical mile allied to a top end of 36 knots; but if you explore the upper reaches of the available power band, 50 knots is by no means unattainable. The hidden aft cabin is remarkably bright and pleasant. 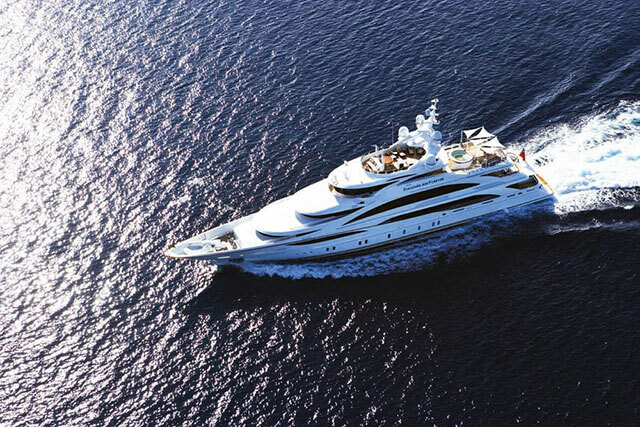 At the most elementary end of the fleet, the ‘O’ model is a fast open runabout with an empty aft deck; above that, the ‘OC’ model comes with an aft cabin but without the T-Top; the ‘C’ model comes with an open aft deck plus a convertible sofa in the wheelhouse; and the range-topping ‘AC’ model features the central wheelhouse as well as the aft cabin, which means four-berth overnighting capacity on a single platform. The T-Top model you see here sits somewhere in the middle of that spectrum - and with its combination of open deck, sheltered cockpit space and aft cabin, that makes it a supremely cost-effective package for the UK boater in pursuit of mixed and versatile entertainment. 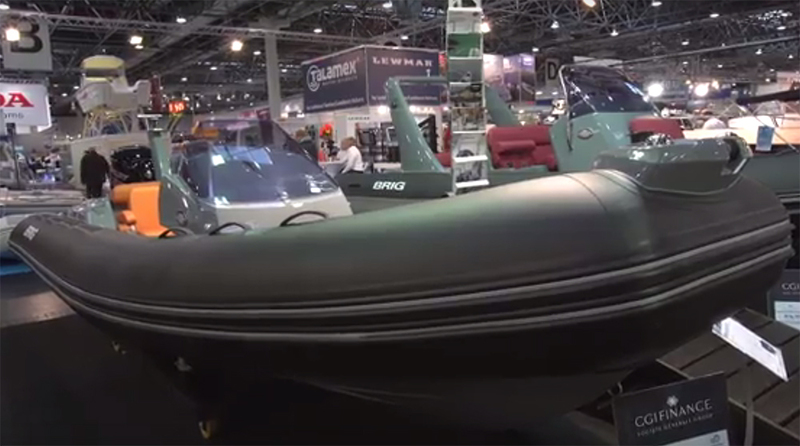 As for the future of Axopar, a larger 37 has now entered the fray, promising twin outboards, a third helm seat, a larger heads compartment and a second double cabin in the forward part of the superstructure. And a 24 has also now been announced. These are certainly exciting developments, but such is the calibre of the existing 28, both in terms of design and execution, that it’s difficult to concern yourself with anything beyond the immediate excellence of this core model. In many ways, the 28 TT is a distillation of the classical Scandinavian four-season approach, but built upon the underpinnings of a more aggressive, more sporting hull and offered at the kind of price very few boats from this part of the world can match. 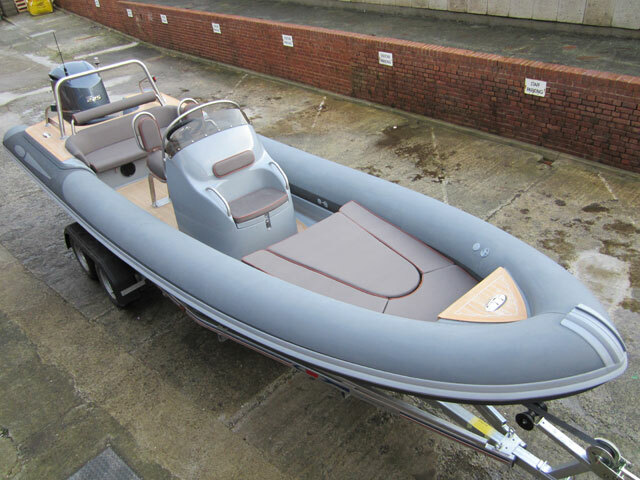 With all-in prices hovering around the £80,000 mark, this distinctly classy powerboat represents a cut-price route into the kind of high-end, multi-purpose Scandinavian entertainment few of us might have believed accessible. Check out a few other reviews on boats.com to compare with the Axopar 28 TT, including: Draco 27 RS review and Windy 29 Coho.